This week I spoke to Andrea Lown of SmartBride about her entrepreneurial journey. It was Andrea Lown's own experience planning her wedding which led her to start a business helping brides lessen the burden. Andrea's enterprising idea caught on, and now SmartBride successfully matches up buyers and sellers every day to help their big day make good financial sense. This week I spoke to Andrea Lown of SmartBride about her entrepreneurial journey. Regardless of how many television shows you watch, or magazines you read on the subject of weddings, you are never fully prepared for a wedding's impact on your time and your pocketbook. It was Andrea Lown's own experience planning her wedding which led her to start a business helping brides lessen the burden. Andrea's enterprising idea caught on, and now SmartBride successfully matches up buyers and sellers every day to help their big day make good financial sense. Karen: It's often said to "go with what you know." Can you explain how you came to create Smart Bride? Andrea: I left it to the last minute to find a dress [for my wedding.] I had about two and a half months to do it. All the stores were turning me away saying that I needed six months to order a dress. They literally would not take the money I was trying to throw at them. I tried to find a dress on Craigslist, but had bad experiences because girls would not tell me that they significantly altered the dress, so I'd get there and not even be able to zip the gown up. The search functionality was terrible, and it felt dirty looking for a gown on craigslist simply because of the UI (user interface). I set out to make an online boutique where it would be acceptable to buy and sell without so much stigma. As it turns out, people's perceptions have changed drastically since 2008 about wearing a used dress, or selling your gown after the wedding. The recession hit just at the right time to give bride's an extra financial nudge. Karen: What was the original concept like? Did you fill out a business plan? Andrea: I created a rough business plan -- certainly didn't follow any template. The most important piece is really the financial model which was entirely ad-based. We added different paid services for both individuals and retailers a year or so later, and are continuing to add other revenue streams. Weddings are a hyper-niche market where your customers are turning over every 12 months. The key to this game is a low cost of customer acquisition which makes your marketing strategies a key piece of the business plan. Karen: Did you bootstrap Smart Bride on your own? Karen: Did you ever take funding? Andrea: Small friend and family loans -- almost negligible. 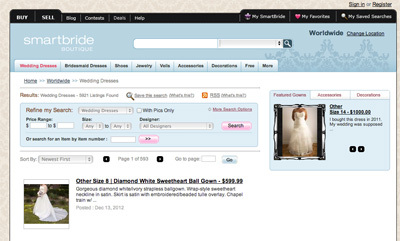 Karen: What was it like in the early days of SmartBride before other online fashion companies joined in? Andrea: At first the concept of buying/selling used dresses seemed odd to people. But people's perceptions are really changing. People are coming around to the fact that a wedding day is really just the start of a marriage, and not all the emphasis should be placed on this one-day affair. I think weddings like Kim Kardashian's are really driving that point home. Before I started the company, I did a survey with 500+ Canadian women and 76 per cent of them said they would consider a used wedding dress provided they didn't have to sacrifice the designer or style they had chosen. There was a big gap in the market, but it was still a struggle to build because you have to grown both buyers and sellers in multiple cities across Canada and the U.S.
Karen: Many entrepreneurs we talk to describe the bumps in the road on the way to success. Can you tell us a story of a time when you experienced something unexpected. Andrea: The most difficult period for SmartBride was actually the initial build process. Coming from being a product manager at AOL, you're used to having a team of designers and developers at your disposal. Sure, it always feels like you are strapped for resources even in a big company, but you definitely don't appreciate how much you can do on practically nothing until you start something yourself where every dollar counts. As a non-technical founder, you rely entirely on your contractors to bring your idea to reality. The first 2-3 months the website was live were incredibly nerve-wracking. Generating your first 1,000 visitors to the website is much harder than the next 100,000. Now, I have other companies approaching me because they've seen the traction I've gained on a shoestring and want me to apply those same efficient strategies for them regardless of how big their budget is. What was excruciating at the time has now turned into one of my biggest strengths and assets. Karen: How did you initially gain traction? What did you define as success early on? Andrea: Word of mouth is huge for SmartBride. I knew that the key to building the business would helping brides sell their dress as fast as possible for the most money. If we helped them succeed, they'd refer us to their friends. So the site features were designed entirely around helping brides sell their gowns. In order to do that, you need to please buyers too -- so we concentrated heavily on making sure sellers gave all of the important information about their gown, educated them as to pricing and how to take/edit their photos and more to create a really compelling ad. Early on you have to celebrate the little wins like an acquaintance telling you they heard someone on the streetcar telling their friend all about SmartBride. Or you receive an email from a bride who sold her dress and can't wait to tell all her friends. Karen: Your business model has a hurdle, namely that you need a lot of inventory to keep the interest high. How easy was it for you to get interest going? Did you use traditional PR to get there? Andrea: We've tried traditional PR, but it's hard to measure whether it's actually impacting our key metrics. In terms of attracting brides to sell their gowns, we do some paid search around selling wedding dresses, and partner with other wedding related websites that can recommend our services to their brides after the big day. Throughout the life of the business, I've challenged myself to what I can the three foot rule. If someone comes within three feet of me, I'll find a way to tell them about SmartBride. Whether it's on the streetcar or in the line at the grocery store. With a start up, you are literally building awareness one person at a time any way possible. Karen: What have you learned in your time running SmartBride? Andrea: Running your own business, you are forced to learn a little bit about every area of the business. But I think the most important thing I learned was actually what motivates me. Working at a startup, or owning your own business in a roller coaster ride each and every day. I get great satisfaction out of celebrating the successes, and am equally motivated by experiencing the lows because I love to solve problems. For some people, failure is crushing, and they'll do anything to avoid facing it by rationalizing. I like to face it head on, diagnose the cause of the problem and find a way to solve the problem and never repeat the mistake again. Over the years, I've had many people try to moderate my ups and downs, but experiencing the ups and downs is actually what makes me strive for excellence. Smoothing them out only kills my motivation. Karen:What advice would you give to entrepreneurs at the beginning of their journey? Andrea: Go and work for another entrepreneur who has experienced success and soak up everything you can learn from them.